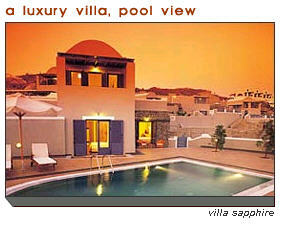 Enjoy the rewards of gold investing at these top-notch private villas on the isle of Santorini, Greece. What could be a better way than to enjoy the fruits of your wisely chosen gold investments than to spend time in these luxurious, richly appointed holiday villas. Greek islands provide a fantastic way to escape it all. Reward yourself with a stay at one of these incredible locations. Just imagine yourself lounging at the pool of this Mediterranean gem - privately, completely undisturbed, or having a pool party with your closest friends. It's your call. 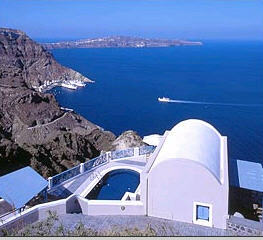 Or, maybe, you'd like to take in the magnificent view of the Aegean coastline from this wonder in blue just above. Just call the appropriate numbers according to season provided below - and don't forget to let the owner know that Alex Wallenwein sent you there. You will receive service you'll never forget. Click here to go to the Volcano View Villas web site, or click on any picture on this page.This is a special treat that you absolutely deserve!